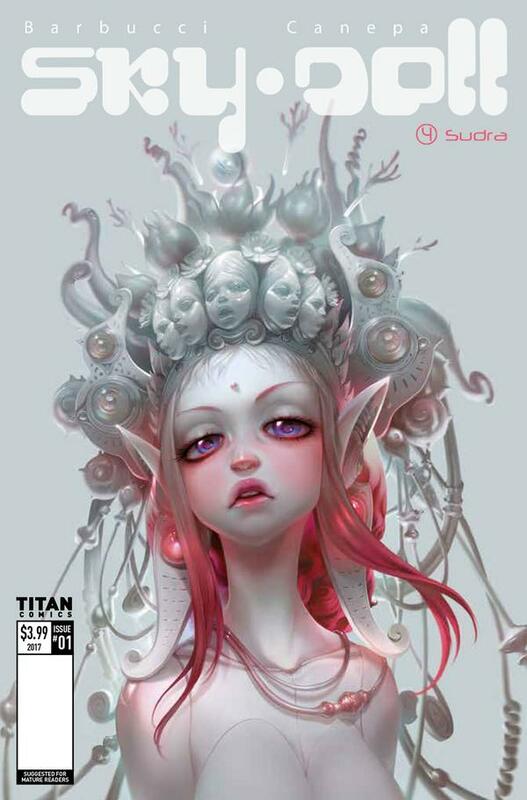 The Fellowship was fortunate enough to obtain a copy of SKY DOLL: SUDRA #1 from Titan Comics. Alessandro Barbucci and Barbara Canepa are the creators. Noa and her friends have finally found a world where they can lose themselves. Sudra is a beautiful world, and it’s a melting pot of species from all over the known territories. Noa knows that she needs to not attract attention, but her miracles are the easier way for her to earn money to feed her little crew. But she has good reason for staying hidden – she is still being hunted by her past. This first issue works hard to establish for us the relationship dynamic of Noa’s group of friends. The story so far is driven by that dynamic, though we do start to get a glimpse of what they’re running from. But what makes this book special is the art; the beauty of Sudra is absolutely stunning. The backgrounds are just as amazing as the action, with expressiveness and design that have to been seen to be believed. There’s a lot in this issue that requires explanation, but that’s not surprising given the exotic flavor of both the story and the setting. And it is certainly a sight to behold. You’ll want to get in on the ground floor for this one. 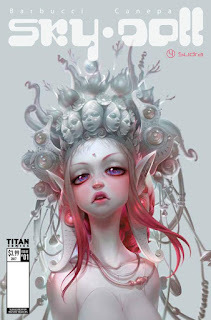 SKY DOLL: SUDRA #1 is available now from your local comic shop, or online at titan-comics.com.